I visited this beautiful place on my last day in Iceland. It's a quiet place one hour from Reykjavik. Contrary to other popular places, no bus full of people there; just 2 cars in the small parking lot. 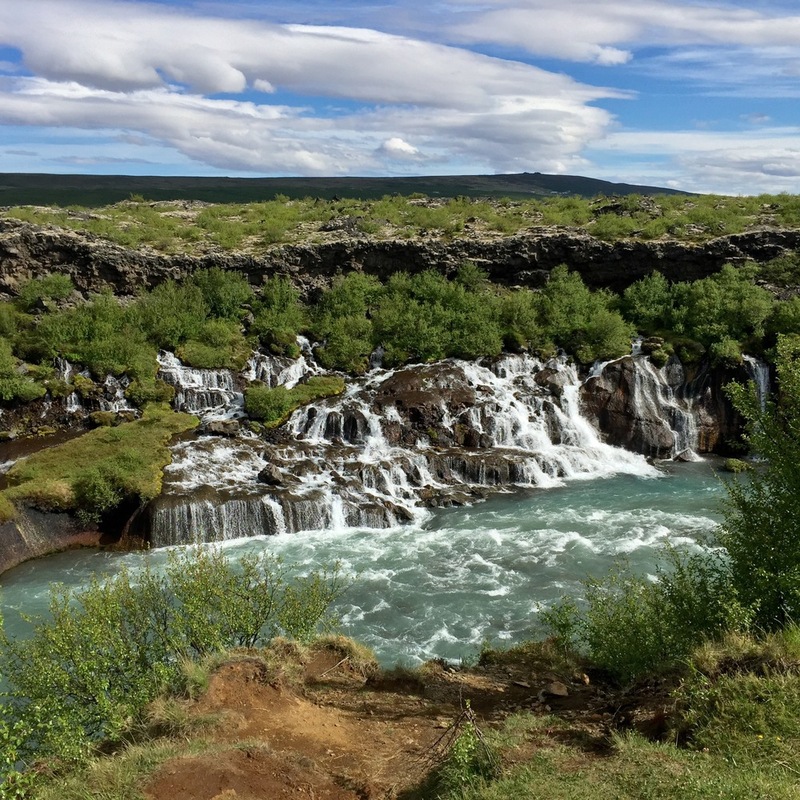 The Hraunfossar Waterfall is really small compared to e.g. Seljalandsfoss or Skogafoss. 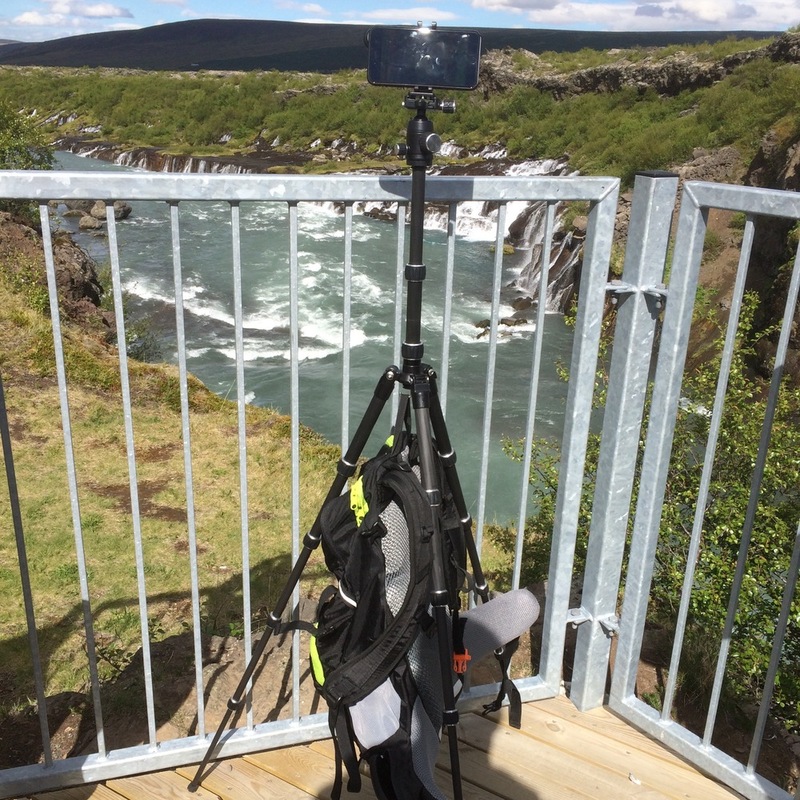 Walk a small path along the river to get a good view (and shot) from different perspectives and to get to Barnafoss ("Bjarnafoss" in icelandic) waterfall. A little up the river was once a stone bridge and there's a legend that it was used by locals to cross the river until two kids fell into the river and drowned. Their mother then had the bridge destroyed. Near the parking lot is a small kiosk, where I met a nice guy from Norway. He told me that not many people came to see this place during the past weeks. And if they did, they just ordered a hot dog or a drink and then left. So guys, if you visit the place by the end of August 2015 (during his holiday job there), say hi to him! Now about taking nice pictures there: It was quite windy and I was afraid the wind would blow down my tripod with my precious camera :) so I hung my backpack on to the hook in the middle of tripod. The light conditions were perfect on this day. I got the shot with the native iPhone camera app.